Everyone is talking about the video on Joseph Kony going viral these days. A few weeks ago, almost everyone also talked of Occupy Wall Street campaign. And now, here is another viral campaign that appears to be a weird combination of Kony and occupy campaigns and it can be called: Occupy UNEP Facebook Page, run by activists of 'Stop Lynas, save Malaysia' campaign. The post shows 27 comments. None of them has anything to say about strengthening of rural women though. (I tried getting a screen shot for you above) and what you will see is this: the page is , from top to bottom, littered with just one single line message: Stop Lynas, save Malaysia. I became a fan of UNEP in early February this year. At that time (which is less than a month ago) each post on the page would get maximum 3-4 comments. Then, from the beginning of March, the number of the comments started shooting up, no matter whatever the post/update was. Curious, I clicked open over a dozen posts to read the comments and what do I see? A specific one liner, commented over and over by different users, posted several dozens of times. Now, honestly, I had no clue what the line tried to say. 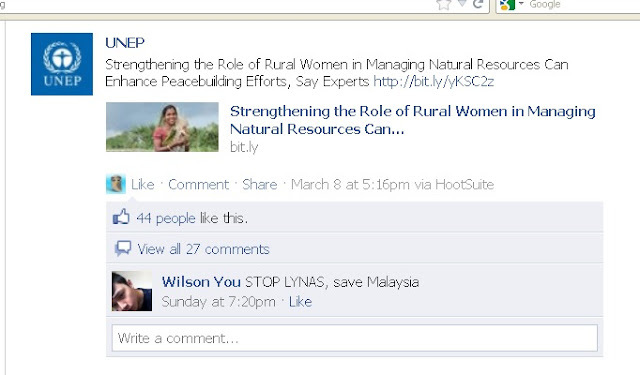 To find an answer therefore, I googled and visited Stop Lynas, Save Malaysia campaign's webpage. My first reaction: utter confusion! The messages are cluttered, the color chosen is black and anyone visiting the site has to really strain her eyes to learn of the basic facts of what this uproar is all about. Anyway, after several searches online here is what I found on the issue: Lynas corporation - an Australian rare earth mining company is constructing a refinery in Kunatan of Malysia which will process precious metals used in the production of mobile phones and flat-screen TVs. But the locals are trying to halt the construction as they believe, the plant will emit dangerous radiation and will put the lives of locals at risk. Question however is, why occupy UNEP page for this? Well, your guess is as good as mine. At first I thought that maybe the World Bank is aiding the project. But no, the money for the plant is coming from US. Mount Kellett Capital Management, a US-based investment firm set up by former Goldman Sachs bankers. So, honestly, why hijack the Facebook page of UNEP? Something tells me that nobody in UNEP social media team has realized the connection either. And if they have, they obviously haven't found a way to get past the barricade. The result: you can't read a genuine response to a post by the UNEP and will instead be forced to return irritated by all the flooding of the campaign messages. 'Save Malaysia', read those messages. To me, however, it looks more like a 'Save UNEP Fan page' situation.